BMW M4 Interior, Sat Nav, Dashboard | What Car? The distinctive M Sport tricolours are widely in evidence, from the stitching on the steering wheel to badges on the dials and door-sills, but it’s the seats that are the biggest difference between the M4 and 4 Series. The M4's seats are electronically adjustable and heated as standard, they offer masses of lateral support and drop very low to the floor if you so wish. Tall drivers may want for slightly longer under-thigh support, but otherwise the M4’s leather seats are really good. The only small gripe a driver might have is with the offset pedals on manual versions – they are slightly to the right of the wheel and force you to sit at an awkward angle. The Competition Pack doesn’t add much inside, save for a pair of lightweight sports seats. These are not of the unyielding bucket sort, but rather a spot-on compromise between comfort and supportiveness. 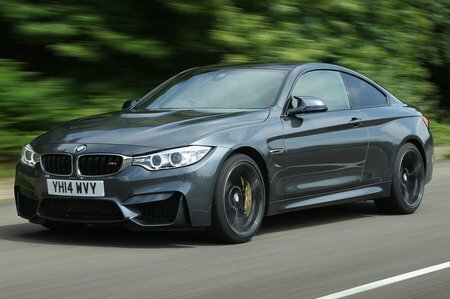 Otherwise, sitting behind the M4’s steering wheel is near-identical to the experience in a standard 4 Series, which is no bad thing. It means you get a classy, easy-to-use dashboard, and the M4 is heaving with kit. This includes BMW’s Professional Media package, which includes a widescreen sat-nav and all-round parking sensors as standard.